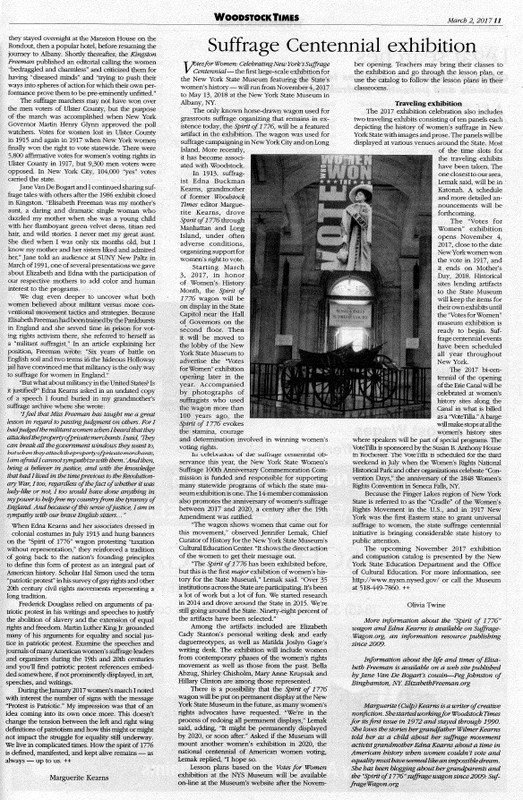 Article by Robert Hughes, Huntington, NY town historian writes about controversy over the “Spirit of 1776” suffrage wagon. March 2017. “Spirit of 1776” suffrage wagon went on exhibit at the NYS Capitol in Albany, NY. to commemorate 100 years of women voting. Lt. Gov. Kathy Hochul invited New Yorkers and visitors from here and abroad to events, exhibits, and celebrations featuring the state as the cradle of the women’s rights movement in the U.S.
We support the New York State Museum in putting the “Spirit of 1776” wagon on permanent exhibit for now and future generations! 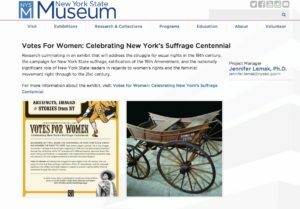 This web site is inspired by the “Spirit of 1776” suffrage campaign wagon used by suffrage activist Edna Kearns that is now in the collection of the New York State Museum. The award-winning music video, the “Spirit of 1776” teaches suffrage history. For overview of the music video on the “New York History Blog.” Patriotic protest is well illustrated in the “Spirit of 1776” music video. 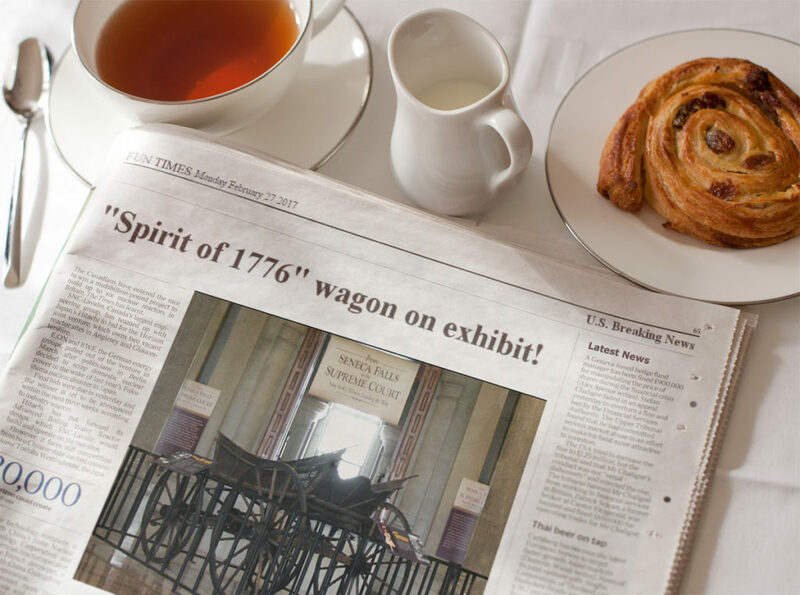 Highlights of media coverage of resolution passed by both houses of the New York State Legislature designating July 1, 2013 the “Spirit of 1776” Wagon Day in New York. 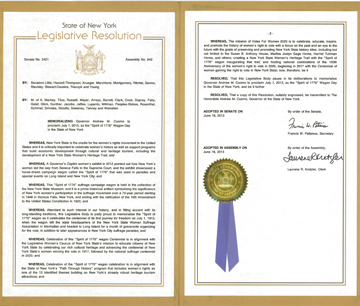 Transcript of June 18, 2013 of the New York State Senate introduction of the Wagon Day (July 1, 2013) resolution.#2. Audio podcasts below. 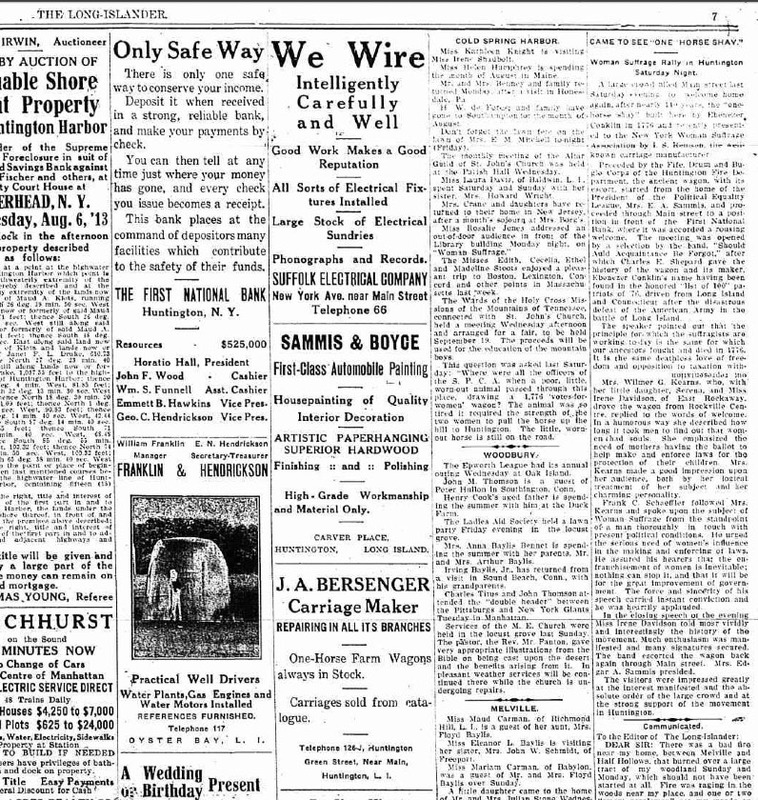 Check out links to newspaper articles highlighting the first voyage of the “Spirit of 1776” in 1913. 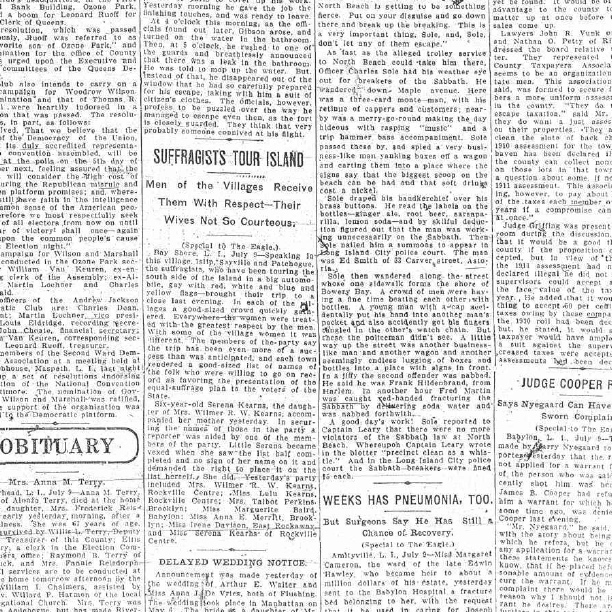 Video highlights newspaper coverage in 1913. 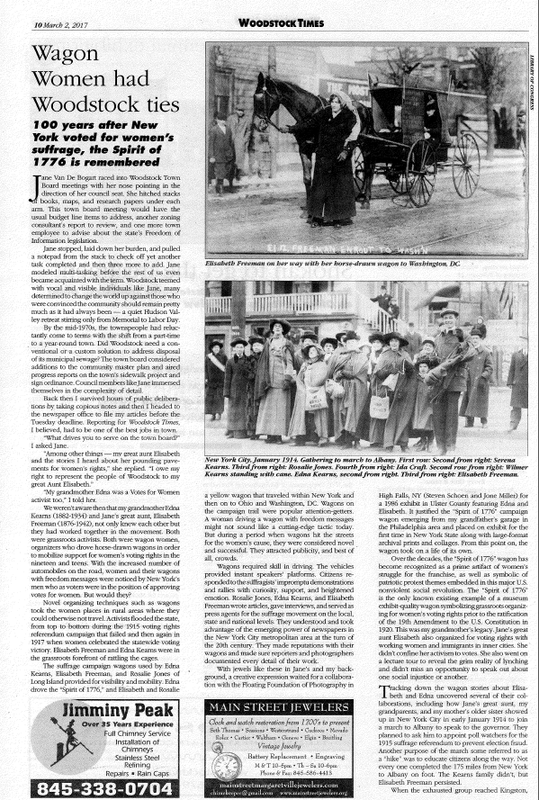 The presentation of the “Spirit of 1776” to the New York State Woman Suffrage Association was well documented in New York City and area publications. 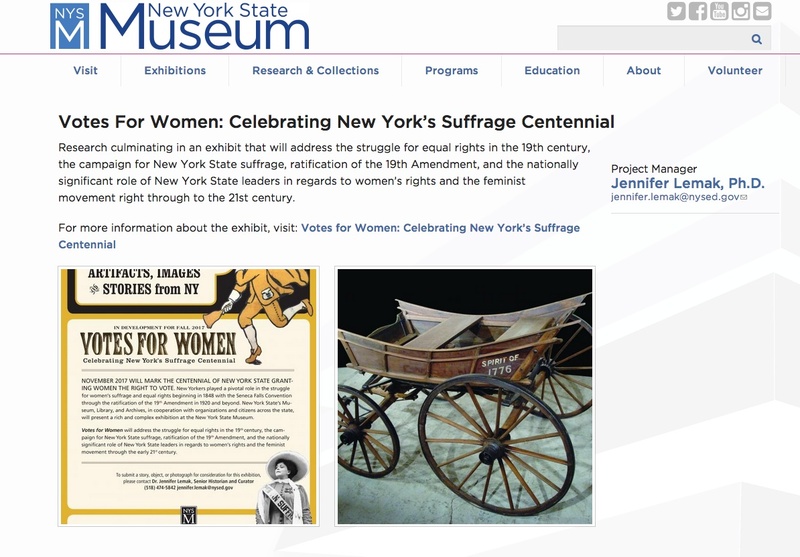 Overview of the “Spirit of 1776” suffrage wagon on exhibit in NYS on Vimeo. 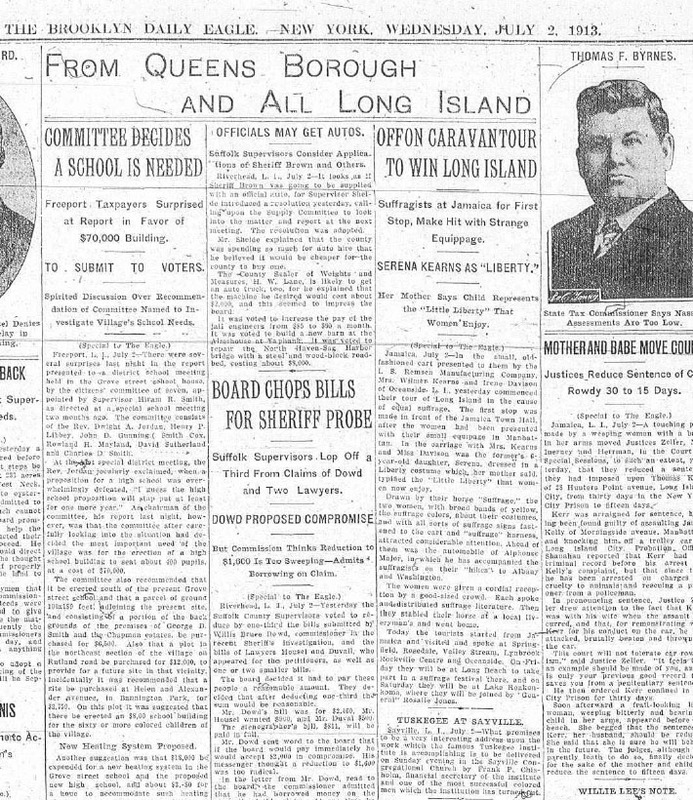 Below: This two-minute audio is an article from an unknown Brooklyn paper on July 1, 1913. 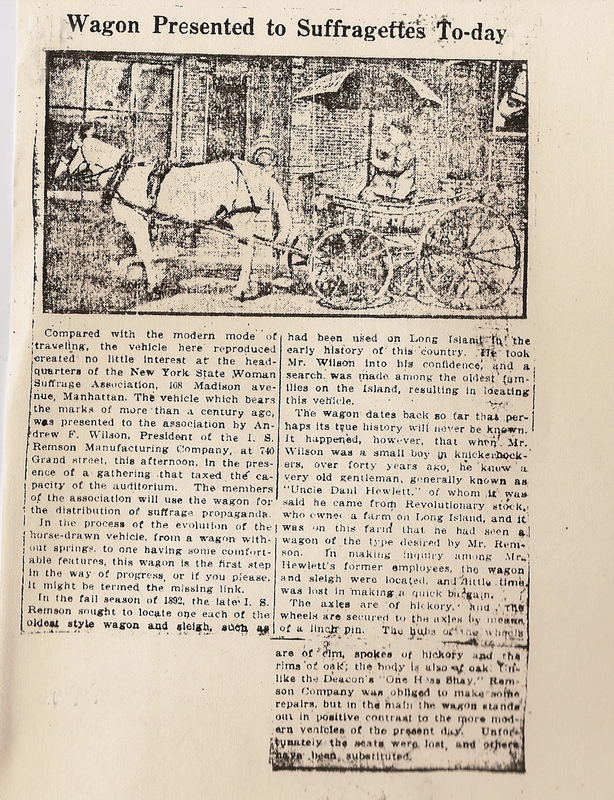 Long Island suffrage stories from Suffrage Wagon. How and why the “Spirit of 1776” was donated to the New York State suffrage movement. The president of the NYS Woman Suffrage Association, Harriet May Mills, saw the “Spirit of 1776” off from Manhattan on its voyage to Long Island for a month of organizing. Vimeo channel for Suffrage Wagon videos. Youtube channel of Suffrage Wagon videos. Videos about the “Spirit of 1776” and its journeys. 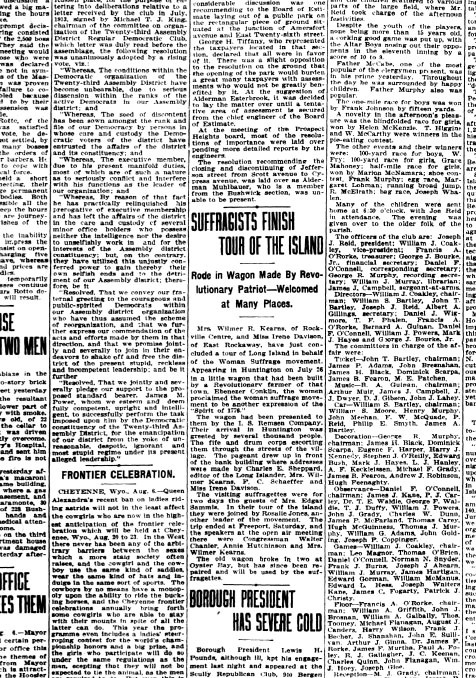 Video highlighting newspaper coverage of the 1913 trip of the “Spirit of 1776” through Manhattan and Long Island. 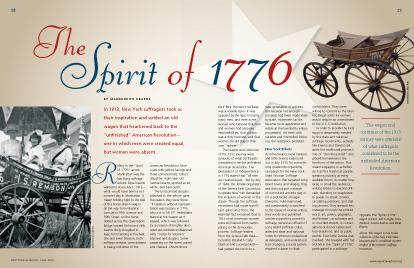 Bibliography and resources for Edna Kearns and “Spirit of 1776” wagon. 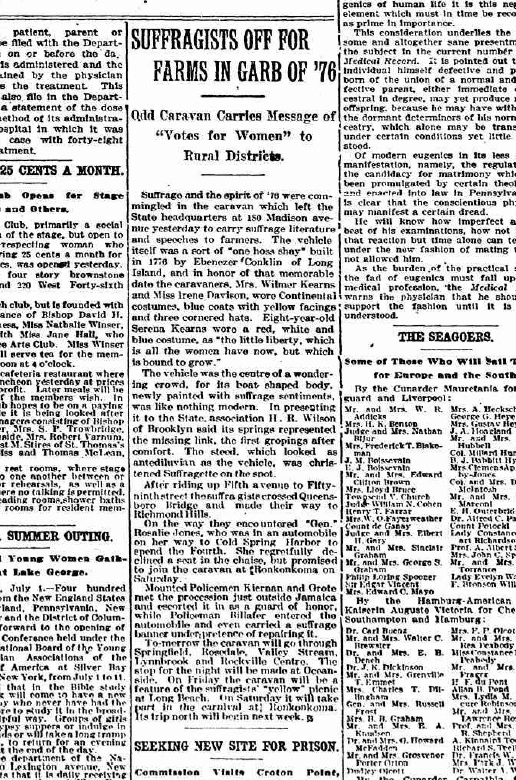 Important resources about suffrage wagons and automobiles. Not many survive, but this coverage gives an overview. 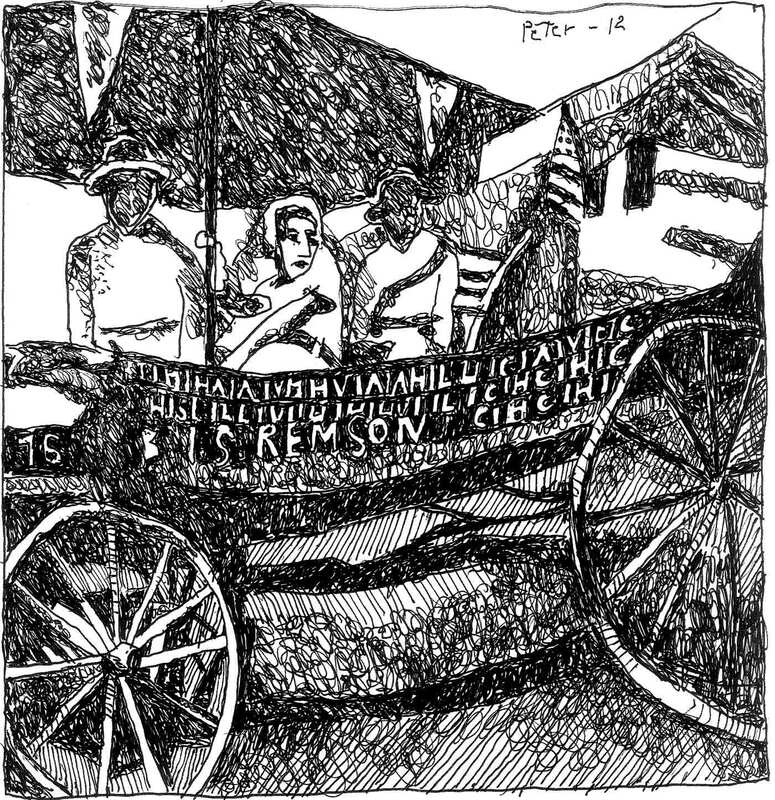 See special videos, plus articles by Ken Florey about how wagons and automobiles were used in the Votes for Women or suffrage movement. Twelve reasons why the “Spirit of 1776” is a NYS Treasure. 2018 Publicity about historic road marker featuring 1776 wagon in Huntington, NY. Drawing above by Peter Sinclair. Announcement of New York State Museum’s 2017-2018 show. The wagon was highlighted in the 2017-2018 exhibition catalog for the “Votes for Women” exhibition published by State University of New York Press in Albany, NY and written by Jennifer A. Lemak and Ashley Hopkins-Benton. Follow Suffrage Wagon News Channel on Facebook and Twitter. Quarterly newsletters just by signing up. Suffrage Wagon News Channel has a video channel on Vimeo. Follow SuffrageCentennials.com for news and views about upcoming suffrage centennials. Amazing. I’ve never seen so many resources and for free. This gives me a head start for writing about the 2020 election. 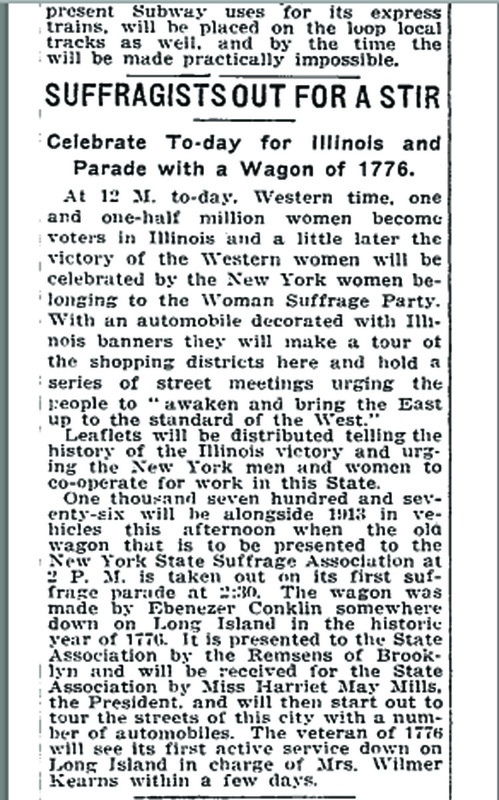 I never knew there was controversy surrounding the “Spirit of 1776” suffrage wagon. It seems misguided. The symbolism and history behind it important for telling the journey of women and their right to vote. I don’t live near the NYS Capitol in Albany, NY, otherwise I’d surely go see it.